I nearly feel obligated to write this blog after I wrote my previous blog post about Shepard Fairey. So much has happened around the art exhibition in V1 and the creation / destruction of a mural at Jagtvej 69 originally by Shepard Fairey. I am not going to give the whole story from A-B as that is already written here: Copenhagen Post 2 (Bad) by S. Fairey him self. Of course with his viewpoint, which I quite like and support. Personally I live just behind the old youth house at Jagtvej 69. I have always supported the Youth house in the battles and the conflicts against the government and the insane Christian sect, Faderhuset. As I wrote in the previous post I was thrilled about the initiative of decorating the wall. 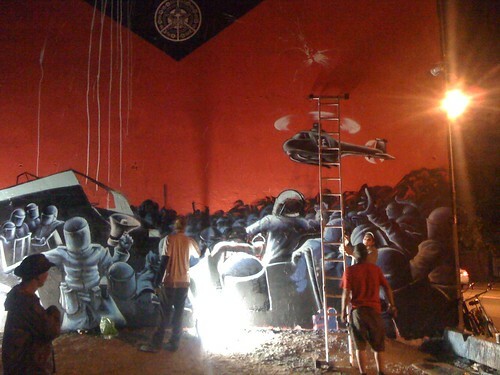 And I was amazed to discover that Shepard Fairey was the one to do the decoration. Photo by Peter Grønkjær, from Flickr. I know and I understand that the tention around the youth house still is very tense. The slogans that remains: “not forgotten, not forgiven” also states that peace don´t come easily. And that I understand. When I saw the art piece I saw it as a positive change to an abandon and at the moment filthy ground. I saw it as a well known and respected artist paying respect to the Youth house and the movement. 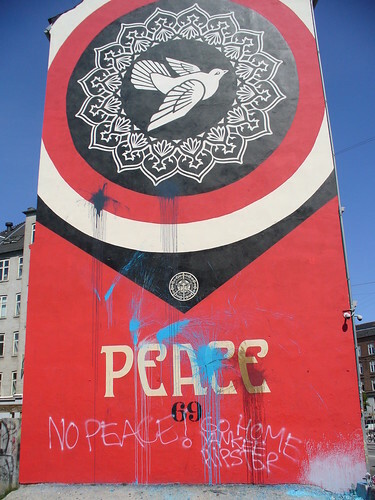 How ever, some unknown individuals bombed it with paint and took the wording “peace 69” as an insult. I personally think that’s an act of narrow minded individuals that seeks the opportunity to feel Suppressed. In my view this act is based on looking for trouble and reason to be offended more than looking for possibilities and positive change. What I really like was the solution to join forces with local streetartist from the youth house culture, to find a way where they felt represented too. When I read that in the newspaper I though by my self that a powerful piece would evolve from this cooperation. It did in deed ! I really think that this is fantastic art! super skillful young people from the Raxart crew. Well done! This photo is by Rasmus Osterhammel, taken from Shepard faireys facebook blog.